A little convict escapes out of his prison entering an unconventional world where the objects awake to life and where he gets completely transformed despite himself. 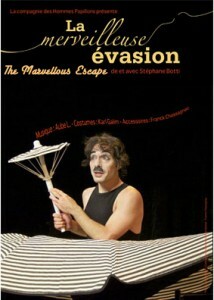 Interdisciplinary show mixing mime, burlesque, acrobatics, dance, magic et winks to the great figure of the Tramp underlined by the captivating music of Aube L., The Marvelous Escape is a tribute to the power of imagination. * Public : Anybody, starting from 3 years old onwards, for street performance or in a theater. * Public dispatching : half circle or in front.